The team at Beachcombers Vacation Homes is always looking for ways to improve our services and client relations, and that starts by hearing what you have to say. See what some of our former guests have said about their stay at one of our Beachcombers Vacation Homes. We want you to feel comfortable and confident that you have a great experience when staying in one of our vacation rental homes. Cute, little cottage by the sea. Very clean and everything you need to cook in the kitchen. Love that it is pet-friendly and easy walk to the beach. The tasteful decor was my favorite :). We will definitely be back! The entire staff at Beachcomber Vacation Homes were professional, genuinely cared about every aspect of our stay, and the home was clean, beautiful, and comfortable. The room was clean, modern, and very comfortable. Everything we needed was there and the price was outstanding. Everyone at Beachcomber was friendly and professional. Seascape Retreat met all of our needs and exceeded our expectations (which were pretty high, based on the photographs!). It was the perfect spot to hold our volunteer group retreat, and I can't recommend it highly enough. Our house was ready early on arrival day. Receiving a call 3 hours ahead of check in was so nice. Check in early bonus! Amazing...the views from the living room wherever direction you look out the windows. The Loft is great. The bathroom is pretty out dated on the loft bathroom, but the main bathroom which as been remodeled is very nice. Great staff. Had no issues except the oven stopped working and needed servicing. But we worked around it. They were very helpful answering questions prior to our arrival. Helped out with letting us in for an early check in. Were helpful when the door code email went missing (ended up in my junk mail). We were thrilled. My mother who is quite particular was in awe of the property and was very pleased and impressed with it. We loved the comfort, amenities, location. It had a place for everyone to be on their own and places for all of us to be together. We loved our stay! This was our first time staying at a Beachcomber property and I would highly recommend working with Barb in Cannon Beach. She was very helpful when we were making our selection and again when it was time for our stay. Costa Brava Villa was the perfect place for our family holiday. The home is even more lovely than the pictures of it and the water views are gorgeous. This was the easiest process I have had with renting a vacation home. A big thank you to your attentive team. I felt comfortable and right at home. What a wonderful place to rejuvenate and relax!! 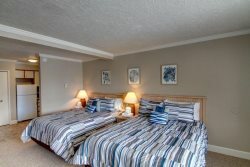 Great location, reasonable prices especially for cannon beach! Enjoyed interactions with the office when I called to change my reservation twice. Very accommodating and friendly. We had three rooms while in town for our wedding and the rooms were perfect.